Welcome to our page on Reading Rhythms and Counting Music. It includes our free Counting Music activity that shows you how to count rhythms, and connects your knowledge of fractions and length to musical notes. You will also find information on our expanded activity, featuring multiple time signatures (2/4, 3/4, 4/4, 6/8, 9/8, 12/8) and a preloaded book of rhythm sets. How to play Counting Music: Scroll down until to see the activity below. Using your mouse, click on the note and rest buttons in the same order they appear on your sheet music, and don't forget your ties. Notice the ruler — it helps us see the length or duration of musical notes. As soon as you fill up an entire measure (or inch), you may play your rhythm by pressing the bottom left "Play" button. To select a sound (i.e., voice or drum), press the toggle button on the left. Lastly, you may want to see and hear some of Phil's favorite rhythms by pressing the "Rhythms" button. You will hear examples from his Reading Rhythms book, along with excerpts from Peter and the Wolf, Morse Code words, ancient Aztec rhythm syllables, and drum language phrases from Ghana and the Congo. Now you're ready — let's count some music! 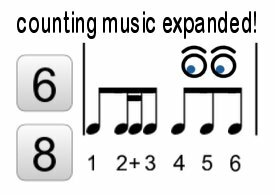 "Reading Rhythms - Counting Music Expanded” is a bundled product that includes the Reading Rhythms PDF book, and the expanded version of our free Counting Music web application. If you already have access to the expanded activity, please click here! The expanded “Counting Music” web application includes and plays all of the 119 rhythm sets (preloaded). In addition, it allows the user to design and save rhythms (via the “Email It” feature), unlocks the use of triplet eighths and triplet quarters, and plays the following time signatures: 2/4, 3/4, 4/4, 6/8, 9/8 and 12/8. The expanded activity is a web-based application that is available to use on your computer, smartphone, or mobile device. After purchase, you simply enter your email address to use the activity, wherever you are!